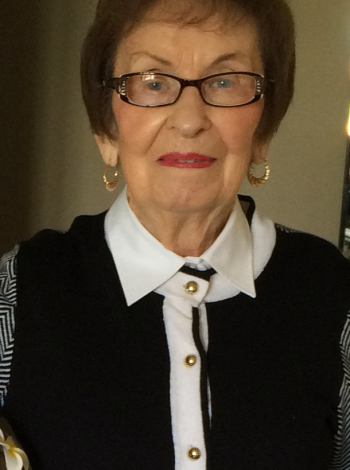 Eva Schwartz, passed away after a brief illness at the Health Sciences Centre on Tuesday, December 19, 2017. She is predeceased by her husband Mendel. Leaving to mourn: sons Abe (Eden), grandchildren Jared, Tara, Aaron; Julius (Maureen) grandchild Michael (Renee), great-grandchild Allie, grandchild Michelle, great-grandchildren Samantha and Benjamin; Philip (Cynthia), grandchild Christopher (Andrea), great-grandchildren Abi and Emma, grandchild Jonathan (Tanya) and great-grandchild Madelyn. Also leaving a large circle of relatives and friends. No visitation. Funeral service will be held at The Carnell Memorial Chapel, 329 Freshwater Road on Thursday, December 21, 2017 at 2:15 p.m. Interment at the Jewish Cemetery, Blackmarsh Road. In lieu of flowers donations in her memory may be made to Canadian Cancer Society. Our deepest sympathy for the loss of your mom. I have many happy memories of time with her when we lived in Deer Lake. Philip and Family,sorry for the loss of your Mom. To Abe, Julie, Phil and Famlies on the passing of your mother, our deepest sympathy. She was a great lady. To the Schwartz family: We were shocked and sad to hear of your moms passing. Eva was a wonderful person , kind ,friendly ,and always genuinely interested in how all our families were doing! What an outlook on life she had! Always cheerful and positive!! She loved her sons and their families and enjoyed sharing news about them!! Rest in peace,Eva!! Your friends and neighbours will surely miss you! Deepest sympathy to all the family! So sorry to hear of Eva’s passing, she will be fondly remembered by my family. Eva was one of my grandma’s (Margaret Warr) very best friends and I can remember her from a very young age. She always had a smile for me and something kind to say. I loved chatting with her, she will be missed. To Abe and family- so sorry to about the passing of your mother . You are in our thoughts and prayers . So sorry to hear of your Mom’s passing. Thinking of you at this sad time. Saddened to hear of your mother’s passing. I lovely lady who’ll be missed in my hometown, Springdale. At the clothing store, your mom and dad (and Julius) were always extended generous terms to our family of limited means when buying a shirt or a suit of clothes!! We were very sorry to hear of Eva’s passing. She will be missed greatly by all who knew her as she was a wonderful lady with a great sense of humor and a fabulous outlook on life. She spoke often of her family and of their kindness and thoughtfulness toward her, and how proud she was of them. We are thinking of you all. The Seabright family. We are thinking of you and your family today and offer our sincere condolences. My condolences to the Schwartz family. Your mom was a wonderful lady and I have fond childhood memories of time spent around your home. My thoughts and prayers are with you at this time of loss. We were so sad to hear of Eva’s passing. We will never have another neighbour who was as kind and caring as she was. She will be greatly missed on our street. Thinking of you all during this difficult time. Philip and Cynthia—My sincerest condolences on your Mom’s Passing. May your Family be comforted among the mourners of Zion and Jerusalem. My deepest sympathies for your loss! Mrs. Schwartz was a great lady. I first met her when I started working in Springdale and would visit her house. She filled me with lots of stories and sang the praises of her children and grandchildren. She also filled my belly and would not let me leave until I had a cup of tea and some cookies with her:).. she inspired me so much and I enjoyed being in her prescence. A great women indeed! So sorry to read that your mother, Eva had passed away. We had met her on one of our visits to Springdale.. Please know that we are thinking of you at this very sad time. You must all have great memories of a lovely lady and these memories will help with the loss of your loved one. Phil and family. We are so sorry to hear of your mom’s passing. Our sincere condolences to you and your family. Abe, Eden and Family, So sorry to hear of Eva’s passing. I met her many years ago, and I know she was a wonderful lady. My deepest condolences. Barbara Budgelll. So sad to hear of your Mom’s passing, sending thoughts and prayers for you all . Phil, Cynthia & Family. So sorry to hear of your Mom’s passing. Our thoughts & prayers are with you all at this very difficult time. Millie (Whitten) & Tommy Donovan. We are so profoundly saddened by Eva’s sudden passing . Eva was a very integral part of our Mitchell family as a true friend to our mom forever and always a great spirit who we visited and spent time with on every trip home as far back as I remember. Don and I send our love and heartfelt thoughts to Abe,Julius,Philip and their spouses as well as the grandchildren who she loved dearly. I will truly miss her dearly and treasure those cookies all these years each year which Donna, Ken ,and I shared with her in September..nanaimo bars as you all well know . Abe, Julie, Philip: Sorry to hear of your mom’s death. Our thoughts are with you at this sad time. Was so sad to hear of your moms passing . Eva was a special client of mine who was always upbeat , so cheerful and always concerned about others. Loved her family dearly and cherished life . Will miss her deeply. I am so saddened to hear of your beautiful Mom’s passing. Your mom was a lovely, kind and compassionate lady, she was always so good to me when I lived in Springdale. I have wonderful memories of your mom and dad in the years that we lived in Springdale. Even after we left Springdale and returned for curling or just to visit I always saw your mom & dad. May all of your wonderful memories help sustain you all as you journey through this sad and difficult time of your lives. My thoughts and prayers are with you all. We were very sorry to read in the paper the passing of your mother. Our thoughts and prayers are with you at this difficult time. I am so sorry to hear of your Mom’s passing. She was always very kind to us as children and always smiled at us when we passed by her house. My sympathies on your sad loss. Sorry to hear of your mom’s passing. We will miss this sweet lady in Springdale. We meet from time to time and always love to chat with her. Special thought of you and the family during this time. Sending our deepest sympathy. So sorry to hear of your mom’s passing. We have so many fond memories of your mom and dad and you boys growing up, while we lived in Springdale. We visited your mom every time we returned to Springdale, and enjoyed her company as usual, and she kept us informed of you and your families. Sorry we are out of the province at this time and are unable to be with you, but be assured our thoughts and prayers are with you all. So sorry to hear of your moms passing.. Eva was loved by many from Springdale & will be sadly missed!! I got to know your mom through curling & every year since she gave up curling her Joan & Marjorie became fondly known by many of us as the golden girls… Shawn always lives in Springdale & has known your family for many years..Our son in law Nicholas has many fond memories of helping out your mom when he grew up next door.. Again sending heartfelt thoughts & sympathies to all of the family.. So sorry to hear about your Mom’s passing. Springdale as lost another lovely citizen but I believe that she will be missed and remembered by everyone, as a beautiful lady. Hold your memories close as they will help you, as you go forward. Hugs. Sincere condolences to all the Schwartz family. Eva was such a kind, considerate lady. It always amazed me how she seemed to remember everyone’s family and ask about them. She will be missed in our neighborhood. So sad to hear the news of your Mom’s passing. I have fond memories of our growing up in Springdale and the family get-togethers. Your Mom especially looked after me when I moved away to attend university and outfitted me with my first job attire. I hold her dear in my heart. I will miss seeing her on my visits to Springdale. My thoughts are with you and your families at this sad time. Please accept our deepest sympathy in the loss of your Mom. She was certainly a beautiful person who will be so missed in this community. Always enjoyed chatting with her. She always took such a interest in how we were doing. Our thoughts are with you at this sad time. Fond fond memories of this lovely lady.she always knew me and chatted me up whenever I was in Springdale. One of the iconic ladies of Springdale for sure. RIP EVA…. Abe, Eden and Family, so sorry to hear of your Mom’s passing, my thoughts and prayers are with you all. Mrs Schwartz was such a lovely lady. I remember going into her store and how kind she and her husband were, always. When we lost our mother, they reached out to us with support, allowing us to take home clothes and allowing pay my father to come in at another time to pay. I’ll always remember the tobacco smell. Sometimes I’d go in just to get a whiff:). You will be missed Mrs Schwartz. Sorry for your loss. My sincere condolences. Just heard of Eva’ s passing. Her and Mendal were wonderful to parents my Leo and Vera, and to my own family. So sorry for the family’s loss and a loss to one of Springdales greatest. To Phil and Family, very sorry for your loss. Both Lisa and I send our sincere condolences. Sorry to hear of your mother’s passing. A remarkable lady who will be missed by all who knew her. Sorry to hear about Mrs. Schwartz’s passing. We have fond memories of dealings with her when she was involved in business here in Springdale and of wonderful conversations with her in later years as between friends. She was always so cheerful and a joy to meet. Abe, Julie and Philip, our prayers are with you. Our deepest sympathy to you. Our thoughts and prayers are with you. Your mom and my mom were great friends. Oh dear !! So sorry , great lady great family . Going to be missed . Sharron & Scott Saunders formally from Springdale NL. Deeply saddened by the passing of my 2nd mother, Eva. She always treated me with respect on trips home and same returned in kind. Eva loved all of the children and was very proud of their achievements. She always showed me their pictures and filled me in on what they were doing. Truly a very private and caring person. I will miss her dearly. Sorry to hear of Eva’s passing. We will miss her around here; she was always so friendly and encouraging. Eva was my dearest friend for many years. She was like a sister to me. I will miss her dearly, wish I could be there with you today. So sad to hear of your Mom’s passing. One of the nicest ladies we ever met. She was such a sweet caring concerned person. Always had time to chat,she would start with a cheery ” Hello.,how are you my dear. ?” With her unique accent it was a pleasure to chat with her. You are blessed to be able to call her Mom. May God Bless you at this difficult time. Eva was a special lady who left a wonderful legacy and will be remembered by all who had the privilege of knowing her. God Bless you all as you mourn her passing. We read of your mom’s passing in today’s telegram. Our prayers and thoughts are with you. Hopefully, she had an enjoyable life and you have a lifetime of joyous memories. So shocked to hear of mrs. Schwartz’s passing. It has only been a couple weeks since I visited her with my parents. She has always been a part of our family and was always concern about us. Mrs Schwartz never wanted to burden anyone whether family or friends and would do her best to help others. We will miss her greatly. My deepest sympathy to all of you. I have spent much time with your mom/grandmother and I can only tell you that she spoke nothing but love for you all and she expressed how fortunate she was to have such a family. She was so proud. My heart is heavy today. Take care and know that others are there for you at this difficult time. So shocked to here of Mrs. Schwartz passing, going to miss her so much! My husband did some work for her and whenever she would see me in the grocery store where i worked she would ask about him. Very lovely lady. Always was good to see her come and shop in the grocery store. Our condolences to the famiy. Abe, Philip and Julius, I’m so sorry to hear of Aunt Eva’s passing. You are all in my thoughts. Sending love at this difficult time. Oh how sad! Mrs. Schwartz was such a beautiful lady. Never bumped into her once in the community without a brief conversation which always started by her asking., how are you doing my dear? Our condolences to her family. She will be missed and forever remembered. Barb and I are so sorry to hear of your loss. We are certainly thinking of you at this time. To Abe, Julius, Philip and families. So shocked to hear of Eva’s passing. Our condolences to you all. Your mom was a very special, lady, she always had a kind word whenever I met and was so proud of her grandchildren. Know you are in our thoughts and prayers at this time. Abe,Philip, Julius and your families, I am so sorry to hear of your Mom’s passing. I have many fond memories of your Mom (and Dad )when I lived in Springdale. Our thoughts and prayers are with you at this time. So saddened to hear of Aunt Eva’s passing. I will always treasure my visits with her. Oh, how she loved to have company, and she made everyone feel welcomed. Please know that my thoughts and prayers are with you. Very sad to hear this today. I will miss Mrs. Schwartz around town. Every time I met her, she spent the first few minutes telling me how lucky I was to have Bradley and how she enjoyed living next to his family. Then she moved on to seeking nutritional advice. She was a wonderful lady and we had many good chats. I will miss those nice talks. Eva was such a kind, beautiful, happy woman and eternally proud of everyone in her family. She loved Newfoundland and regarded the people of Springdale with great affections; she was extremely proud to call Springdale and Newfoundland her home. All who knew Eva can testify to this! It is such an honour to have shared in the many conversations my family and I had with her over the years, over her delicious cakes and cookies. The people of Springdale will regard our memories precious and blessed, and we can only consider our lives more enriched for having known her. We are sad to hear of your Mom’s passing. Will miss her beautiful smile, her asking about all the kids and talking about her family Hugs to you all. Very sorry to hear this! I grew up in Springdale living next door to Mr. and Mrs. Schwartz. I have the fondest memories of painting fences with Mendel when I was a boy (and plying Eva for treats). Such a wonderful couple to have as neighbours! Eva will surely be missed around town; such a dignified lady! We were fortunate to have known her. I was shocked to hear the news of your mother’s passing. We lived next door for more than a decade and we truly appreciated your parents as great neighbours. I always enjoyed the many conversations your mother and I shared (as recently as October) as she told me about how the family was doing. She just loved those phone calls and visits especially from the grandchildren. They were so important to her. She will truly be missed. Sending love and prayers to you all. Eva and always had great chats at the grocery store in Springdale. She always wanted to get updates on prices lol how I am, and my childreen. I feel blessed to have known her. She will be greatly missed in Springdale. The Schwartz Family: So sorry to hear of Eva’s passing, she was a fine beautiful lady. Primrose and Tony Burton, Springdale NL. Please accept our condolences on your mother’s passing. We have fond memories of her when we lived in Springdale. May she rest in peace. To the Schwartz boys and their families. What fond memories we have of your mom, always giving and loving. She has been a part of our family’s lives since forever. Going to be missed by many. We are sorry to hear of your mother’s death. Our hearts and thoughts are with you and your families. Phil we are sorry to hear of the passing of your mother. We send our sincere condolences to you Cynthia and your family. So sorry to hear of Mrs. Schwartz passing. We loved her visits at the office and enjoyed the chats. She loved her family so much and always talked about you all. She will be missed by everyone here in Springdale. A kind hearted soul. Saddened to hear of your mother’s passing, she was an amazing woman who had a long and eventful life. Her family meant everything to her. My condolences to you all, she will be greatly missed by all who knew her. To the Schwartz’s family: So,so sorry to hear of your mom’s passing..She was my neighbor for years in Springdale and was a great,elegant lady.She will be missed by many. Take comfort in all your precious memories of her. She is with the angels now..
We are sending our deepest sympathies to Mrs Schwartz’s family today. What a wonderful woman! She was a friend to all and cared so deeply about her friends and family. I have such warm and special memories of Mr and Mrs Schwartz as a child and was so sad to hear of her passing. She was loved dearly and will be forever missed. Please accept our condolences, our thoughts are with you as you lay your mom to rest. Your mom was a beautiful lady Inside & out, every time we met it was a privilege to have a conversation with her….Rest on peace my friend! Sorry to hear of Aunt Eva’s passing. Our thoughts and prayers are with you all. Sorry we can not be with you at this time. We were surprised and saddened to learn the news this morning about the death of your mom. She was an unforgettable lady and she and your father were a wonderful couple. We feel fortunate to have met them both. Your mother led a long and good life and raised a wonderful family. Our thoughts are with you all at this difficult time. I am so sorry to hear of Eva’s passing. I remember her fondly from my time growing up in Springdale. She was always so friendly. A bright light. A wonderful woman. My condolences. Philip and family. So sorry to hear of your Mother’s passing during this time of year. I didn’t know your mom but I am sure she gave you some of her traits. My sincere condolences. Abe and family. Sorry to hear about your mother’s passing. I have fond memories of our chats where you talked about your mom and the family history. Abe, , Julius, Philip and Schwartz family: I was so sadden this morning to hear of your mom’s passing. I have fond memories of my visits to you mom’s store as a young man growing up in Springdale. She was always such a gracious and elegant lady. RIP dear Mrs Schwartz.